Ahh... Doesn't a drop of Brandy always look so smooooth, so sophisticated and so warming? I've always fancied myself as a bit of a Brandy drinker, but it's pure fantasy, since every time I attempt to drink one it doesn't taste 'warming' at all... more like burning... yes, that's it... like the entire top layer of skin has just been stripped from my oesophagus... like I have just unwittingly swallowed a mouth full of Nail Varnish remover, or accidentally swigged a mouth full of turps instead of tea (and I speak from experience there)! The same applies to wine. It doesn't matter how expensive the bottle is, £5... £20... Have I ever detected a 'delicate hint of oak' or 'fresh spring meadows' or 'fruity citrus notes'...? Um... sorry, but nope! All I get is the taste of vinegar. So, I might have the palette of an Artist, but clearly I don't have the 'palate' of a wine connoisseur!! As uncultured as it might make me, I'm afraid the only alcoholic beverage I truly enjoy is a nice cold Lager! Straight from a bottle, straight from a can, in a glass, in a dog bowl, whatever - I am truly not fussed. That is just what I like! 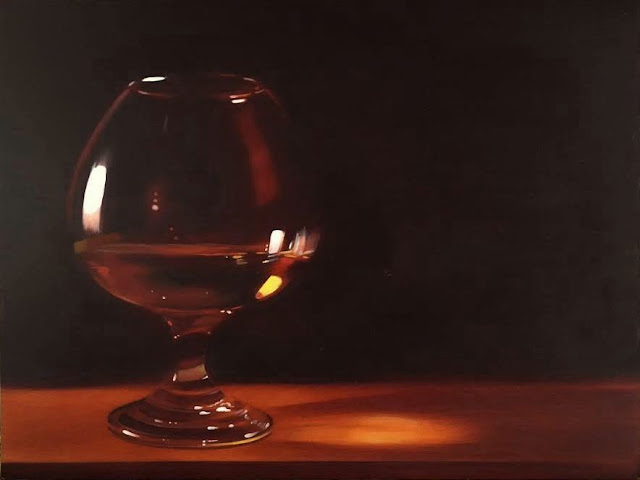 Anyway, I may not be able to enjoy drinking Brandy, but that's not to say I don't love to paint it! And here it is, the only way I would ever drink it willingly. This painting is so soft, beautiful! 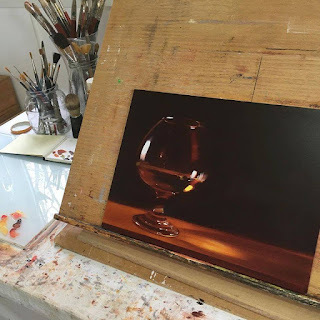 I love this post because not only is your glass of brandy fabulously painted to the point where I also want to take a sip but I can fully relate to the whole wine thing! I've never been a wine drinker properly-i would have the odd rose wine spritzer when I lived in Portugal but I think diluting it with lemonade lessens the sophistication somewhat and white wine actually gives me a headache as I'm drinking it never mind the next day! Unfortunately I'm not really a beer drinker either unless it's also mixed with lemonade-not keen on the after taste! Spiced rum is my tipple of choice-I guess I just like sweet drinks! Anyway your painting made me gasp and your post made me laugh! Ahh, yes... a cold Bud on a hot summers day... Perfect! Hmm.. well perhaps your taste buds are more truthful now...? Oh no, wait, you still like Vegemite!! I'm glad you like the glass, thank you! I'm working on something quite different now... on a 2ft x 3ft canvas, so quite a bit bigger! I need to use a broom as a Mahl Stick, so it's quite a change! Stunning my friend!!! Warm, rich, inviting. Beautiful job! This post made me laugh - reading about your diametrically opposed palette/palate reminds me of myself. My husband occasionally enjoys a Scottish whiskey called Laphroaig which is distilled on the Isle of Islay. It has a divine aroma and I never pass up a chance to deeply inhale its boggy, peaty smell. But the taste is similar to battery acid if you ask me! 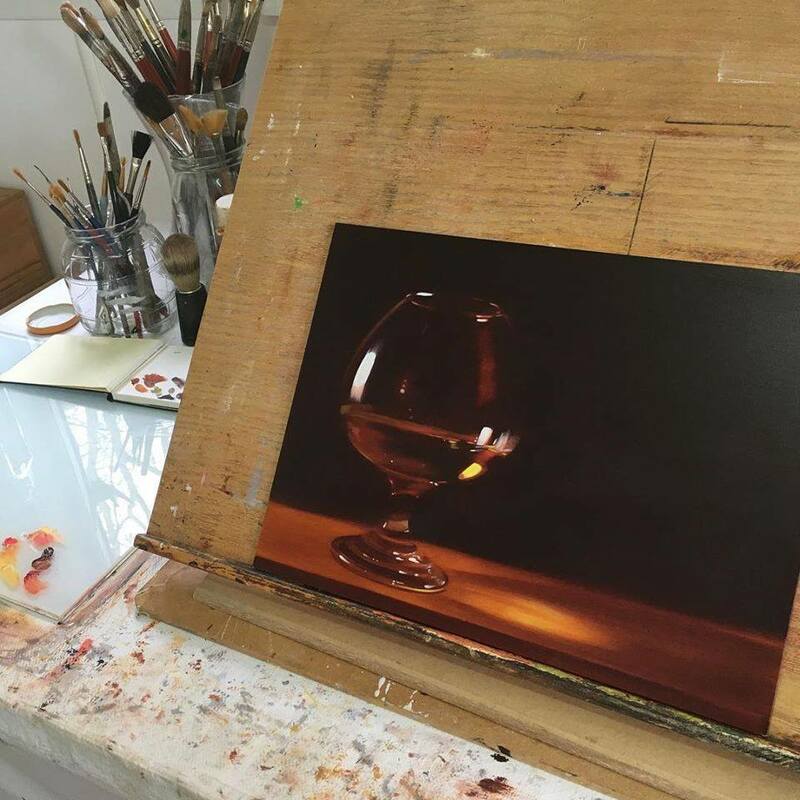 You have masterfully succeeded in painting the smoothness of this glass of brandy! Ahh, yes I am SO with you on the aroma... It's is so different to the taste! Actually, I have been known to enjoy a little Single Malt, but only very rarely do I do that! Very few varieties float my boat at all, but occasionally I will be offered a taste and I can appreciate the flavour, but I seem to have ridiculously expensive taste when it comes to Whisky, lol! But Brandy and Rum are just how I imagine Battery Acid to taste, yes!! Eye-watering! !